Halloween has its tricks. 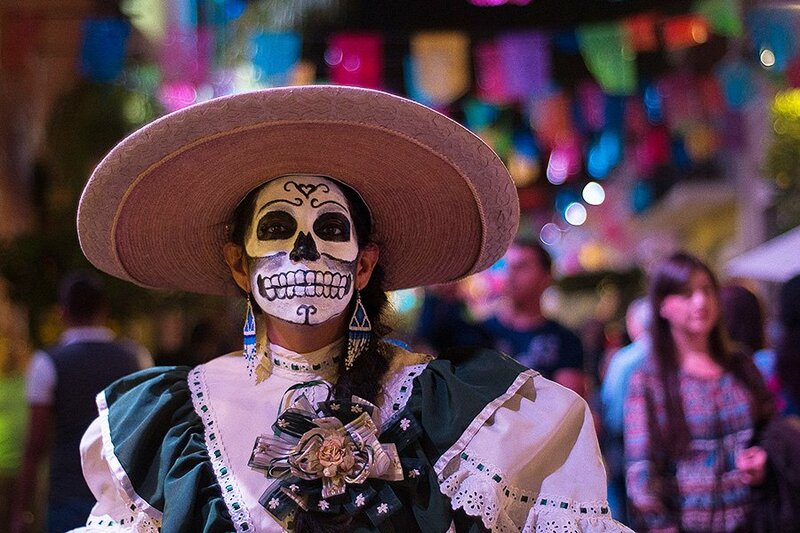 But Dia de los Muertos has its treats — in the form of handmade poems that lampoon, satirize, and exaggerate real people, be they friends, loved ones, the famous, or the infamous. Calaverita literaria is a satirical poem usually written for the Day of the Dead in Mexico. Meant to express things that are hard to talk about (politics, tragedy, death), they're often anonymous: The author doesn't matter because the verses become part of the collective culture. Calaveritas don't follow a strict form, have no defined length, and are not required to rhyme, but people tend to do them as quatrains (a stanza of four lines). My friends and I have been making calaveritas for each other for as long as I can remember. They consist mostly of making merciless fun of our strengths and weaknesses. The theme always relates to defying Death or being cleverly tricked by the Grim Reaper herself. Part of the poem's charm lies in the fact that every topic is fair game, and no theme is too sensitive to be included. Historically, the purpose of the calaverita was to criticize difficult and controversial themes such as politics and economics. Not surprisingly, I've already found tons of calaveritas dedicated to Donal Drumpf. 2. Select a setting or theme, usually something related to the protagonist. 3. Plan the action: How is the protagonist going to cheat Death? Or how is Death going to get the protagonist? 4. Make your literary choices: Are you going to follow any metric form? A rhyme scheme? Here's an example I wrote for my Fathom colleague Henry. He used to work at DC Comics and Marvel, which reminded me of a very famous superhero-type luchador in Mexico called El Santo. I put these ideas together for a calaverita in which Death, thinking she's clever, tries to trick Henry by dressing up as Superman. Only Henry recognizes the imposter. Death is not deterred. She approaches Henry again, this time as someone he won't be able to recognize — El Santo, the Mexican luchador. This is how she finally gets him. pues en DC y Marvel laboró. cuando de El Santo se disfrazó. Another kind of calaverita is used to criticize controversial matters/figures, usually in the genre of politics, social movements, current events. Here's a prescient example: Most Mexicans (okay, and half of the United States) talk openly about the current American president with words like racist/misogynist /jerk/Cheeto (take your pick). I can hear him now, in his own eloquent vocabulary: "Very very mean. The meanest. Incredibly mean. NOT FAIR." The following poem was written by my well-read and politically minded godfather. The gist: "Donnie" is busy arguing, crying, and fighting with everyone — the media, the Party, and even the people who idolize and support him. He does not discriminate when it comes to insulting and making faces; he mistreats anyone who overshadows him or hurts his ego. While defying North Korea, he has problems with Iran, ignores China, and attacks immigrants. Suddenly, Death decides that she should take him now before he causes too much trouble for her. and spent time hunting immigrants. I'll die from the excessive workload." Give it a shot: Write your own. They're a fun, funny, and clever gift that will be very appreciated by friends and family, who will no doubt be impressed by the inspired and multicultural way you let off steam.